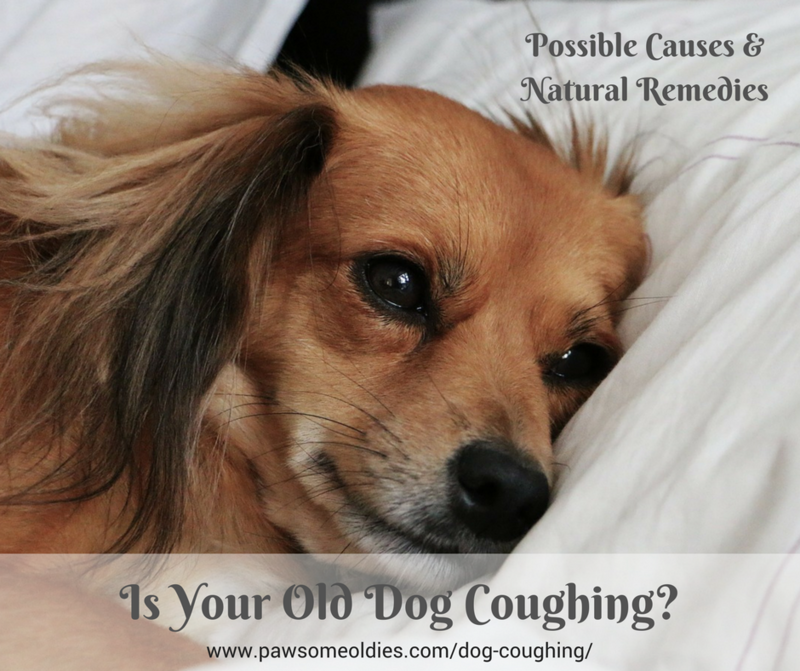 Is your pawsome old dog coughing? Trying to find out what may be the cause? Understand that coughing is not a disease in itself. It is just a symptom caused by some other problems, most of which are health issues. This post is about some common causes of dog coughing in oldies. It also gives suggestions of using some natural remedies that may help your old dog’s coughing. If your old dog has been coughing for a while, and is also showing other illness symptoms, such as weakness, lethargy, fever, panting, coughing up blood, or having difficulty breathing, stop reading this page now and take him to the vet instead. OK. Let’s look at some causes of old dog coughing. If your old dog suddenly starts coughing, try first to look inside his mouth and down his throat to see if there’s something lodged there. Sometimes a small piece of treat (or whatever the dog has “sampled” outside) may have gotten stuck in the throat, causing the dog to cough and gag. If you can remove the object, do so. If not, take him to the vet. Now, if it’s all clear and there’s nothing stuck in the throat, take a look at his collar. Have you recently bought him a new collar, or adjusted the old collar? Would it be possible that the collar is too tight around the dog’s neck? The fact is, environmental irritants and allergens can cause a dog to react physically, which may be in the form of an asthma attack. One symptom of asthma in dogs is coughing. Other symptoms include wheezing, panting, and over time, appetite loss. Just like people, dogs with respiratory problems cough. Of course dogs of all ages can develop the following problems, but oldies can be more susceptible especially if their immune systems are weakened. Bronchitis is the inflammation of the mucous membrane of the bronchi. It can be caused by bacterial or viral infections, airborne irritants and allergens, and even some parasites (e.g. heartworms). Bronchitis can cause coughing that may last for two months or more. If your oldie has bronchitis, he will also show other symptoms such as gagging, wheezing, exercise intolerance, and in more serious cases, the dog’s skin and mucous membranes can turn bluish. Canine influenza is an viral infection that is highly contagious. One symptom of dog flu is coughing. Other symptoms may include sneezing, fever, runny nose, appetite loss, and lethargy. The good news is, if your oldie usually stays home and has not been in close proximity with a large number of other dogs, chances of him getting the flu is rather low. Pneumonia is the inflammation of the lungs, and can be the result of a bacterial infection, a viral infection, or a fungal infection. Parasites such as lung worms and heart worms can also cause pneumonia. The hallmark symptom of pneumonia is coughing (but of course not all cases of dog coughing is caused by pneumonia). Other symptoms include sneezing, panting, fever, lethargy, loss of appetite. CHF is the result of some form of heart disease, which could be congenital or the result of an infection or injury. As the dog gets older, the diseased heart becomes weaker. Heart failure occurs when the heart cannot pump enough blood to meet the body’s needs. One common symptom of heart disease in dogs is unproductive coughing, especially during the night or first thing in the morning. If your oldie has CHF, he will also pant more, have shortness of breath, become tired easily and cannot exercise so much. He will also have a poor appetite and may even have fainting spells. You can also sometimes tell if your oldie has CHF by the way he stands. Dogs with CHF usually stand with their front legs spread wide apart. They also tend to lower and extend their neck to allow more air to get into the lungs. Yes – the big “C” of the lungs can also cause dog coughing. The cough is unproductive (not coughing up mucus), but sometimes the dog may cough up blood. Other symptoms of lung cancer in dogs include difficulty breathing, appetite and weight loss. Lung cancer can be primary (originated in the lungs), or secondary (originated somewhere else in the body and has spread to the lungs). And one of the main causes of primary lung cancer in dogs is? You guessed it – second-hand smoke. If you have a small dog, watch out for a condition known as tracheal collapse. The trachea is the windpipe that is made up of cartilage rings. Sometimes, these tracheal cartilage rings start to collapse, making it more difficult for air to pass through to the lungs. As the air is squeezing through the collapsed rings, a honking cough results. Although this condition can occur to dogs of all ages and breeds, small dogs (especially Yorkies) are more susceptible. So are middle-aged to older dogs. Obese dogs are also more prone to this problem. In addition to coughing, tracheal collapse can cause difficulty breathing, bluish gums, and exercise intolerance. These symptoms may be triggered by excitement, airborne irritants, and even eating or drinking. Here is a quick reference of the types of coughing and their possible causes. 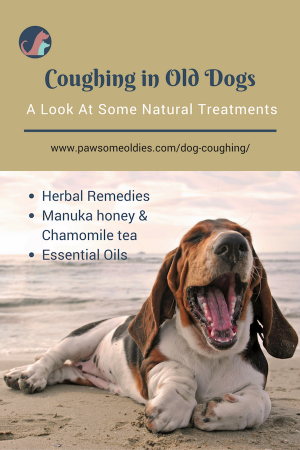 If your oldie is coughing but your vet cannot find any major underlying health issues, or you don’t want to give him excessive cough medicine (or the medicine doesn’t work), try using natural remedies to help soothe the coughing. Very often, they work better than drugs! This natural herbal formula contains throat soothing herbs, such as mullein, licorice root, slippery elm, hyssop, and cherry bark. In addition, immune boosting herbs such as Chinese skullcap and ginger are added to support the immune system. This formula also contains propolis resin, which is well known for its ability to provide powerful lung and throat immunity support. 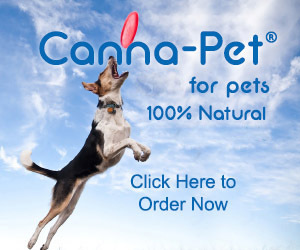 Many dog parents have given this product positive comments. It seems that this formula is beneficial to dogs with cough caused by tracheal collapse, asthma, bronchitis, and other unknown causes. This herbal formula contains Chinese herbs that support breathing and maintain healthy mucous production, and is effective for coughs, asthma and other respiratory difficulties. Dog parents’ comments are positive and it appears that this Chinese herbal product is effective for asthma, bronchitis, lung damage, and tracheal collapse. It is always a good idea to boost a dog’s immune system when he is showing illness symptoms, such as coughing. A lot of supplements and herbs can boost the immune system, such as vitamin C, the herbs astragalus and cat’s claw, antioxidants such as mushrooms, green tea, coenzyme Q10, etc. 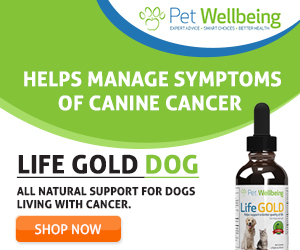 Dog parents’ comments are largely positive and they have seen a drastic improvement in the wellbeing and energy levels of their dogs after using this supplement. If your dog is coughing on and off all day (worse – all night), imagine how stressed and anxious he feels! Here’s a simple remedy that can soothe the cough and reduce stress at the same time. Introducing … (drum rolls please) Manuka honey in chamomile tea. The herb Chamomile is well known for its calming and relaxing effects. Combining the two, and you will get a drink that is both nerve calming and throat soothing! Simply steep a chamomile teabag in a cup of hot water. Add a teaspoon of honey to the tea. Let the tea cool down to room temperature before giving it to your oldie to drink. Most dogs like the sweet taste of honey and will drink it up eagerly. If your dog has a dry cough that may be caused by a dry sore throat, or airborne irritants, use a humidifier to add moisture to the air. If your humidifier supports essential oils, so much the better! Add some essential oils that are both calming and antimicrobial (e.g. Lavender, Roman chamomile, Frankincense, Cedarwood) to help your oldie relax and disinfect the air.